As promised yesterday, here is my first experiment with GMaps. On the whole, I like the technology. It does a lot of the work for you in terms of plotting and it works off on an external xml file. The only real downside is that it does not use actual address information, only latitude and longitude coordinates. There are a number of free lookup services online, I used GeoCoder.us which worked very well, still it’s an extra, probably unnecessary step. I’ll look around and see if there is some automated process out there which does automatic conversions and reports back. On the whole though, a very good and easy proof of concept. 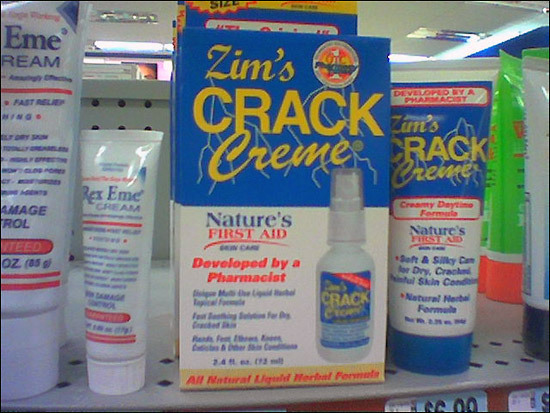 It’s for dry, cracked hands evidently. Google has just released their API for Google Maps! First Google Earth, now this. Google really is an awe-inspiring company. Look for a week in the life of Steve very soon. And as I’m writing this, Mike just sent me a link to it. And for those of you following the screw-you homeowner Kelo Supreme court ruling, check out Hotel Lost Liberty. Sadly, it seems that PBS will be fully funded, here is what the executives make. Google Earth was released today and I’m blown away. Basically it’s a free version of their KeyHole software, but with incredible capabilities. Skylines, tilting and foreign cities, it’s all just staggering. According to the Koran, male martyrs are welcomed to Paradise by 72 beautiful virgins. Ayat, as with many of the women she is incarcerated with, believes that a woman martyr “will be the chief of the 72 virgins, the fairest of the fair”. Second class even in the afterlife. Google-xjaxslt via the Google Blog. We import nearly 58 percent of all petroleum, yet only 45 percent of each barrel is used to produce gasoline, and a significant portion of that gasoline is used in delivery vans and taxis. Commuter and leisure driving accounts for little more than 40 percent of the oil we consume — far less than the amount we import. The rest of each barrel of crude is used for heating oil and diesel fuel for trucks, busses, farm machinery and ships (23 percent), petrochemicals (17 percent), jet fuel (9 percent), asphalt (4 percent) and propane (4 percent). The U.S. index of industrial production peaked at 116.4 in June 2000 and then fell to 109.1 by December 2001; the price of West Texas crude simultaneously fell from $32 to $19. U.S. Industrial demand for petrochemicals declined, and so did the related need for fuel used to transport industrial supplies and products. Similar effects were magnified worldwide. Falling industrial production in any region has the same effect on oil prices, so crude fell from $25 to $12 in the wake of the Asian currency crisis of 1997-98. Nobody in Washington shows the slightest awareness of the global nature of the oil market, of the fact that industrial damage from high oil prices has nothing to do with whether a country imports or exports oil, or even the fact that there is a crucial two-way linkage between worldwide industrial production and worldwide oil prices. When it comes to causes and effects of high oil prices, nobody in Washington shows much interest in logic or facts. It might be sad if it wasn’t so pathologically pathetic. I came across this odd site yesterday while biking on my usual route. 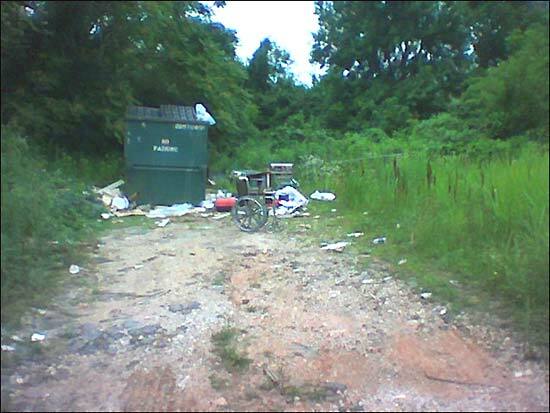 I don’t remember seeing any of this before, either the dumpster or the garbage, thought I think there is usually more underbrush in this area. Behind the wheelchair was a poster for Terminator 2, which came out in the early 90s.